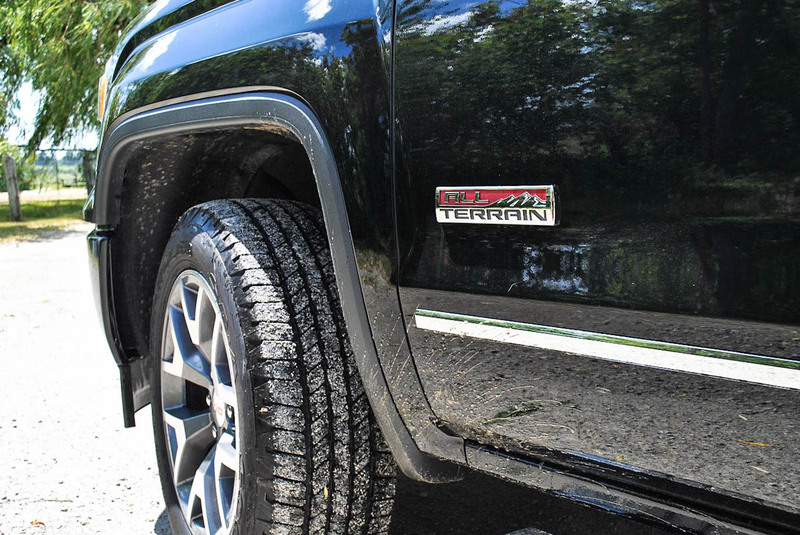 The Sierra is one versatile truck that never feels out of its element. For a lot of us summer means sports car season, top down cruising or rolling around in some classic iron. 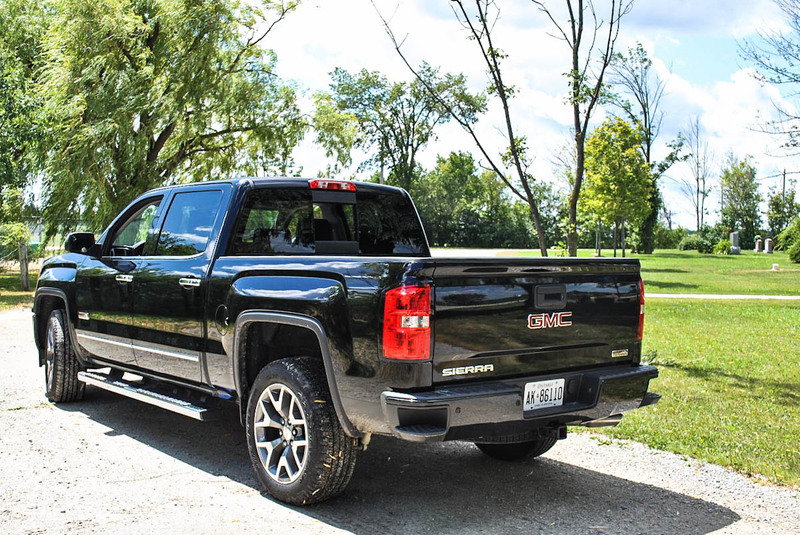 Me though; I typically spend a lot of the summer driving around in pickup trucks, because for us suburbanites summer also happens to be the season of landscaping projects, drive-in movies, trips to the lake and all sorts of off-beat adventures. 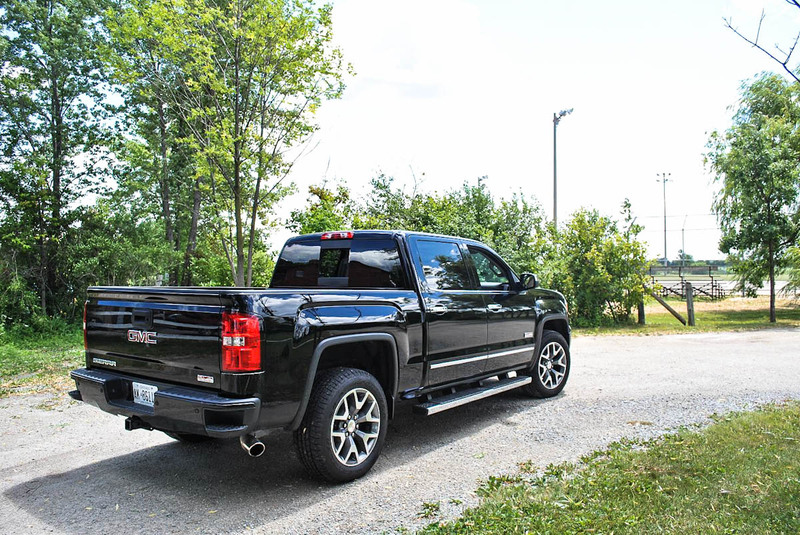 The pickup truck is my vehicle of choice for the summer because it means I’ll always be ready for whatever job or adventure comes my way. With that in mind I happily obliged at the opportunity to spend some quality time with a gorgeous black 2015 GMC Sierra 1500 SLT Crew Cab, equipped with the All-Terrain off-road package. 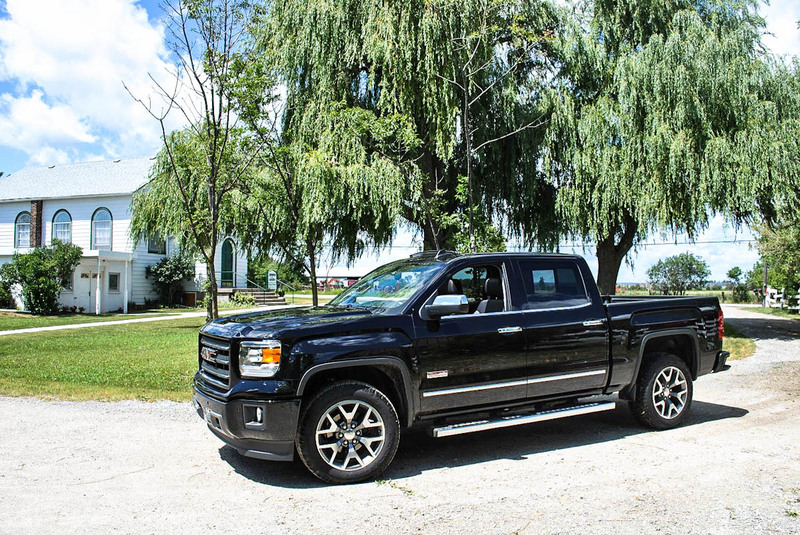 I’ve been a big fan of the exterior styling of the current generation GM trucks since the moment the first pictures showed up online; the lines and proportions are just right in my eyes and I love how GM has maintained some key aesthetic features of the lineage. 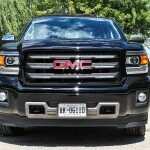 I tend to flip-flop on this, but I think with this generation I have finally come to the conclusion that I do prefer the Chevy grill with its split headlights over the GMC’s large gaping grill. 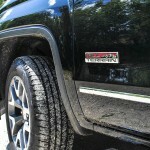 That said, my GMC test truck came equipped with a unique All-Terrain “Plus” package that really helps set off its exterior look with 20” machined rims, chrome step bars, big Rancho off-road shocks and body colored bumpers, grill and trim. 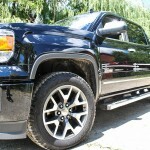 In Onyx Black the truck’s appearance got nothing but compliments all week. I’ve made it known that I am also a fan of the extremely functional interior in the GM twins and that includes this Sierra, with one little exception; the seats on an SLT model like my tester would be fully appointed in soft black leather, however, adding the All-Terrain package replaces the leather on the bolsters with a cheap looking and feeling carbon-fiber look vinyl. The same vinyl also appears on the door panels and it really cheapens the overall look of the otherwise very well appointed interior. 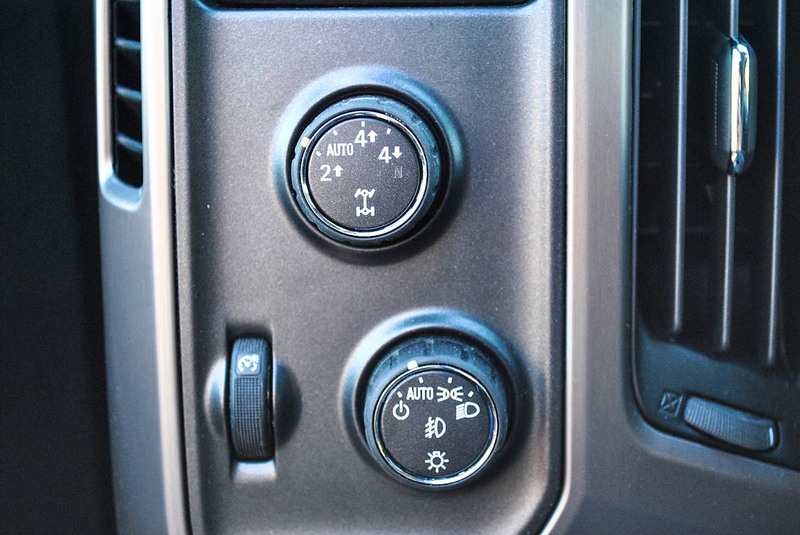 I’ve raved before about the huge storage and intuitive clean layout of the controls in these trucks, so I won’t go into details. I do love the Intellilink infotainment system on the 8” color touchscreen, which is one of the better systems on the market and benefits from very intuitive steering wheel mounted controls as well. 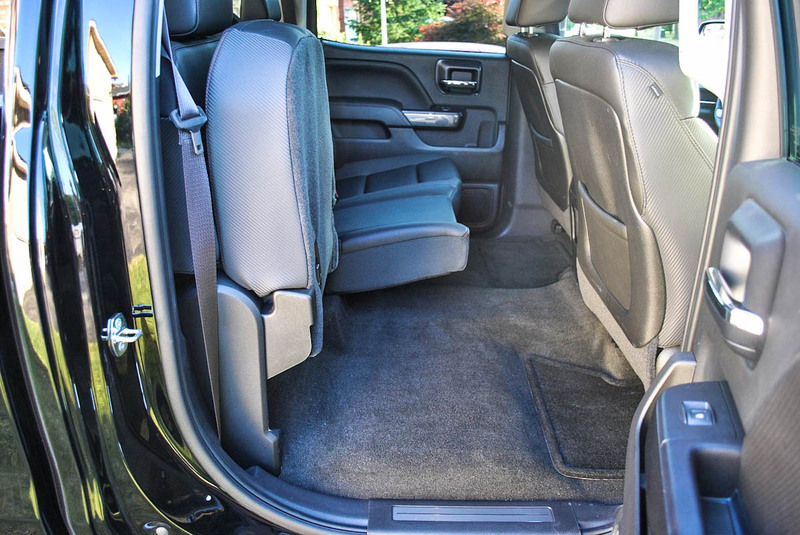 Like most full-sized crew cab trucks, the rear seating area is simply massive, with loads of head and leg room. 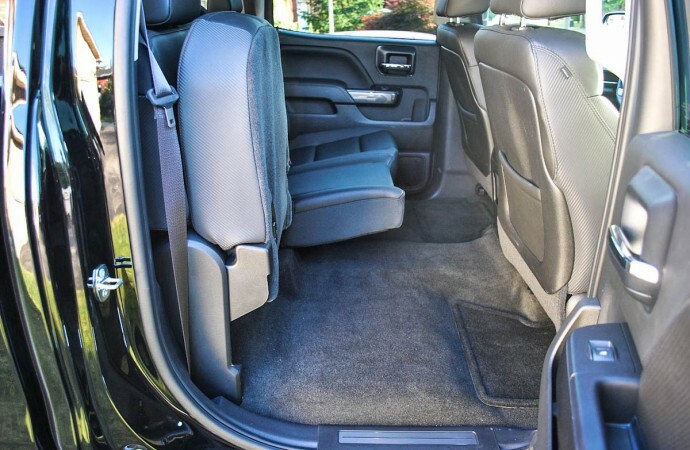 The rear seats flip up flat against the rear wall revealing a flat cargo area comparable in size to the trunk of a typical mid-sized sedan. The space is perfect for groceries or other items you wouldn’t want flying around in the open bed. There’s been a lot of discussion amongst truck fans about which of the big three manufacturers has the best truck interior, and it really comes down to where your own preferences fall. 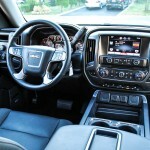 In the last 2 months I’ve spent time in all three of the competitors and I would break it down like this: The Ram trucks have the nicest quality materials and the most striking design features, the new Fords make the best use of space but fall short when it comes to materials used, and the GMs boast the cleanest dashboard layout and upscale materials, but run the risk of feeling a bit boring inside. I can tell you that my favorite is the GM simply because I feel the most comfortable in it. Getting into my Sierra test truck for the first time I was immediately comfortable, with great sight-lines and all the necessary controls perfectly in reach. With a base price of $51,100, adding the All-Terrain Package ($2,220), the All-Terrain “Plus” Package ($2,735), the upgraded 6.2L v8 ($2,745), a sunroof ($1,325) and a handful of incidental add-ons my test track came out to $60,800. 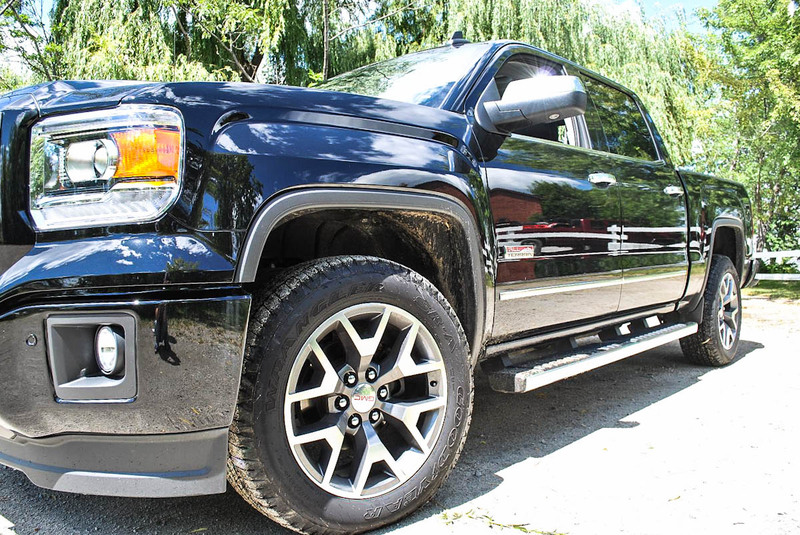 That’s a steep price for a truck that still isn’t the top-line Denali. 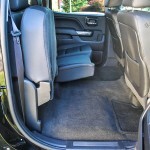 However, it does benefit from a healthy list of luxurious features such as a pounding Bose stereo, power sliding rear window, full power front bucket seats, power adjustable pedals, navigation, satellite radio, rear view camera, park assist, LED lighting all around and Stability control. 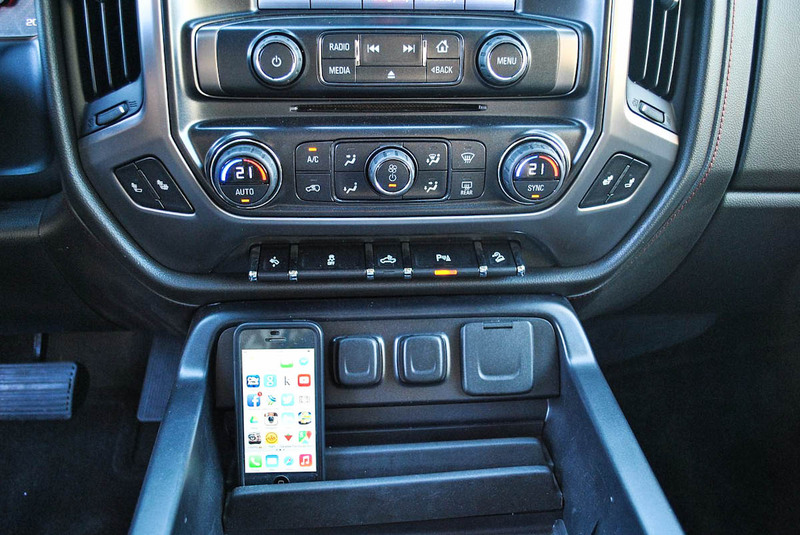 Electronic gadgets are all well and good, but everyone knows that the heart of a pickup truck is its engine and the 6.2L Ecotec3 V8 does not disappoint. Outputting 420 horsepower and 460-lb of torque the 6.2L offers a lot of additional towing, hauling and accelerating power over the more pedestrian 5.3L. 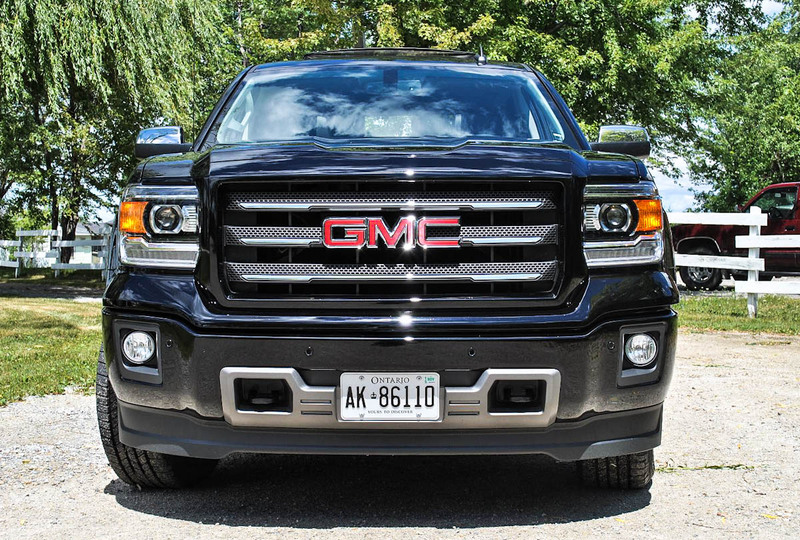 While the 5.3L is a perfectly competent power plant, the extra power offered by the 6.2 is immediately felt in the seat of your pants. 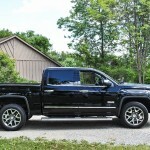 My only wish was that the larger engine was available with a roaring dual exhaust right from the factory, if I’ve got over 400 horsepower at my disposal I want to hear it, if Ram can pull it off there’s no reason why the folks at GM can’t. That beastly V8 comes mated to GM’s new 8-speed automatic, which does a relatively seamless job of keeping the truck in the right gear. 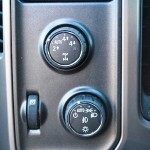 Similar to the 8-speed unit offered in the RAM trucks, I noticed a handful of rough shifts over the course of my week with it, and I attribute them to abrupt throttle position changes just as the transmission was about to change up or down. What the extra cogs in the 8-speed really offer is fuel economy, and on that front it performs exceptionally. Doing my best to resist leaning on the 6.2L’s power and letting the 8-speed do its thing I managed to average 12.9L/100km over my week of rush hour commuting. 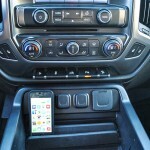 To date, that’s the best weekly average fuel economy I’ve recorded in any gas powered full-size truck! 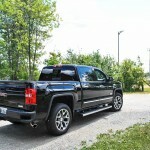 Better than my performance with a similar 5.3L 6-speed equipped truck, and better than the Ford 3.5L EcoBoost V6 I tested immediately after this truck. 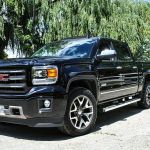 The Active Fuel Management cylinder shutdown system in used in the GM trucks is phenomenal and by driving with a light foot to keep the little “v4” logo on your gauge cluster you can save yourself a lot of fuel. 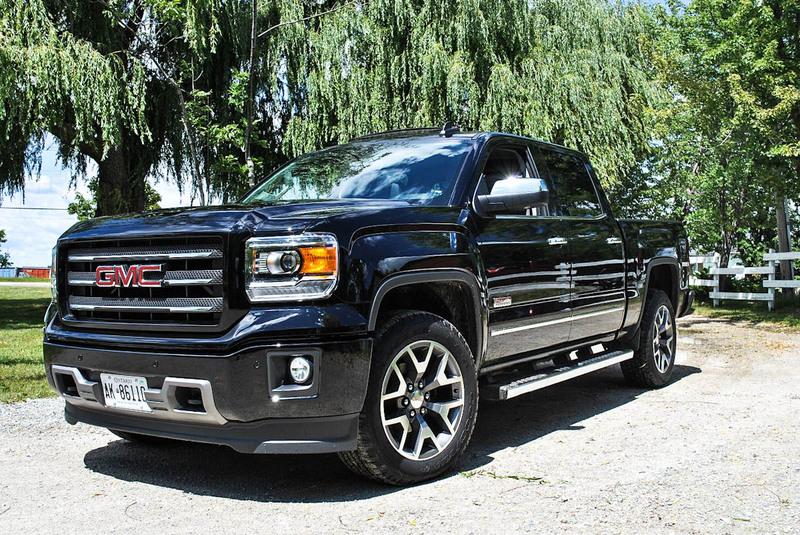 On the road the Sierra feels just like a well-built full-sized pickup truck should, it’s solid and confident with very little steering correction required on the straights. 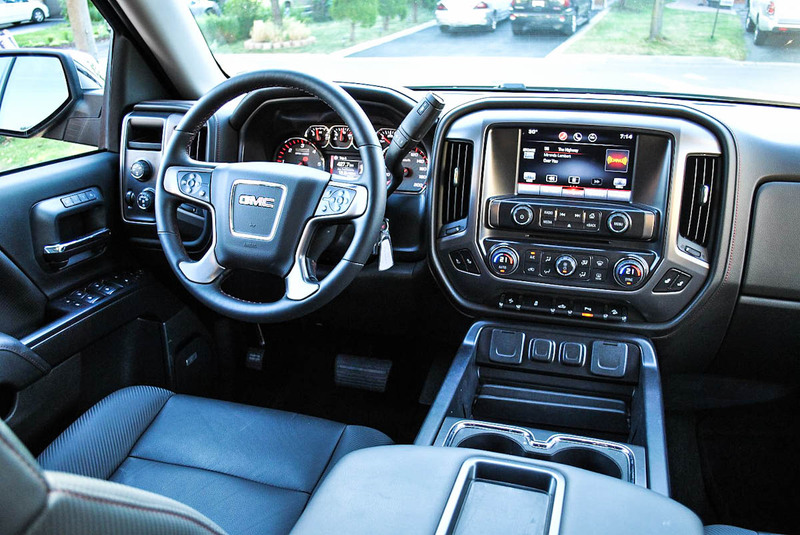 Steering is light, yet precise for its size and throttle response is particularly sharp with the 6.2L. Most notable though is the ride and quietness of the cab at speed. 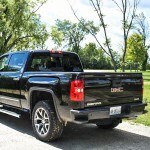 The Sierra glides along keeping its occupants in complete comfort and silence no matter the road or weather conditions. 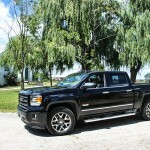 Clearly GM has put a lot of focus on insulating the cab of the Sierra from any exterior noise at all. Speaking strictly from spending hours in each of the full-size trucks on the market today, in my opinion the Sierra and its Chevy twin are the most comfortable, quietest and smoothest riding trucks on the market. 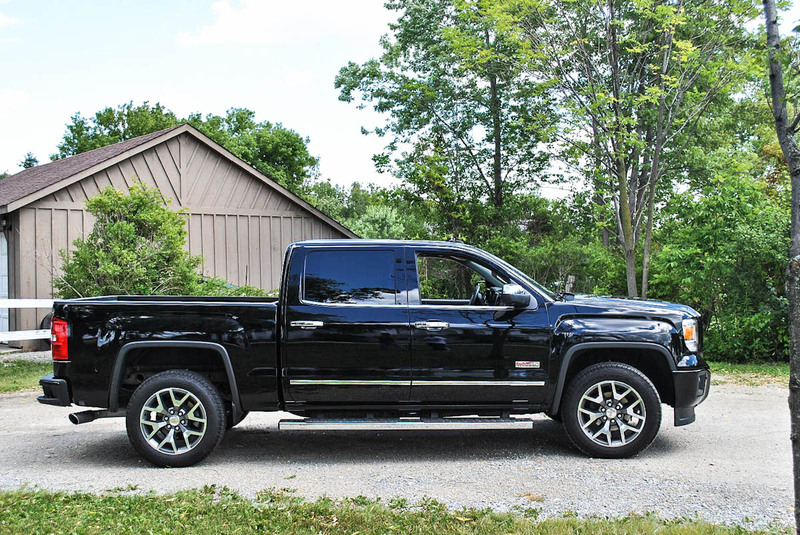 The GM trucks might not tick all the boxes for every buyer, but if we’re talking overall ride quality the Sierra is a clear winner in my books.